The father threw his daughter’s arms into the trash heap, but the next morning—the armless girl long gone—the two arms lay on the table as though the girl was still connected to them. The fingers on the right hand drummed out a beat. The mother served the arms porridge, just as she had done for her daughter. The father picked up the arms and threw them into the trash heap once more. When he returned home for dinner, the father found the mother calling out for herbs, as the arms, fingers prancing from across the wooden table, fetched them. The father knocked over the stew, stuffed the arms in a sack, and threw them into the river. That night, he dreamed of wet hands crawling across his body and ice-cold fingers wrapping around his throat. He woke and listened to the sound of the mother breathing. The next morning, he kept glancing at the spot where his daughter had once sat and was reassured by the empty chair. The next week, when he went to town, he passed the weaver’s shop. There he saw a piece of cloth telling the story of how he sold his own daughter to the devil. The father burst in and pulled the cloth from the window. “Who made this slander?” he demanded. The weaver pointed to the loom where a pair of dead arms scuttled across it like spiders. The father grabbed the cool, white flesh and rushed to the woods, where he buried them. The next week, as the father rested his throbbing head upon the edge of the ale house’s table, he heard a harp. The melody told the story of a man who mutilated his own flesh and blood. The father stood up and saw that the harp was played by a pair of dead arms. He broke the harp, chopped up the arms, and brought the bits of flesh home. He ordered the mother to cook a stew with that meat. When finished, he refused to take a bite, but he watched the mother devour the evidence of his crimes. For a few nights, the father felt free. He had nothing to fear: not the devil, not his daughter, not those tattletale arms. He’d never slept so well. One night, the sound of scurrying woke him. He searched the house but found nothing—a suspicious amount of nothing. No mice, no dust, no task undone. He came home each day and not only was dinner cooked, but also the house was clean, the butter churned, the flax spun, and the clothes mended. One day, he came home early and peeked through the window. There was the mother, her belly heavy as if she were pregnant and around her a dozen arms doing the chores. The mother cried out in pain, but a hand rested a cool cloth on her forehead. 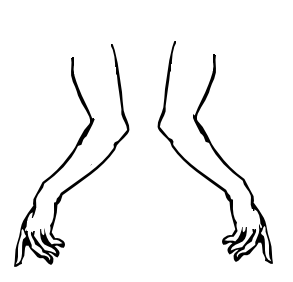 Then the mother birthed another pair of arms. She wrapped the arms in a blanket and rocked them as though they were a newborn baby. The father was furious. He took an ax and burst into the room. The mother looked up at him and said, “Isn’t it wonderful. Our daughter has come back. All our daughters have come back. They have forgiven us.” The father raised the ax, but before he could bring it down, the arms swarmed him. Fingers pinching and pulling. Hands grasping and tearing. The ax clattered harmlessly on the ground, and the arms returned to their daily chores.